France’s National Front party has won a sizeable number of council seats in Sunday’s second round of local elections. Though the party didn’t do as well as was predicted in polls, its leader Marine Le Pen calls the results a "magnificent success." The National Front is "becoming a powerful political force in numerous regions," Le Pen tweeted, adding that that the party won the elections in 43 departments. "We now have a multitude of local officials throughout France, which will help to secure future victories,” she added. Prime Minister Manuel Valls acknowledged the improved progression of Le Pen’s party, though the National Front hasn’t won power in any local councils, according to projections based on early counting. "The FN [National Front] is now implemented nationwide, it has reached a level that is high, too high,” Valls told France’s Le Journal Du Dimanche. Le Pen’s party, however, didn’t manage to outpace Nicolas Sarkozy’s UMP (Union for a Popular Movement) party and its allies, which took about two thirds of the possible 98 departments, according to projections. The ruling Socialists under guidance of the current President François Hollande were defeated. Left-wing parties managed to grab only between 27 and 37 councils. The socialists previously had 61. "Tonight the Republican right and the center have clearly won these departmental elections. Never before in the Fifth Republic has our political family achieved such a result,” said Sarkozy, hailing the victory of his party. "Through this vote the French public has massively rejected the policies of François Hollande and his government,” he added. Hollande’s ratings are at a record low and there are fears in the Elysee Palace that he won’t even ‘survive’ the first round of presidential elections. "Everyone in the [Elysee] is scared he will be eliminated in the first round in 2017," a presidential advisor told AFP. An even bleaker future for Hollande’s party was predicted by Gilles Finchelstein, a political strategist close to the Socialists. "The left is in danger of dying [and] risks becoming nothing more than a residual political force,” he told L’Express magazine. Guerlain said that Le Pen, as the far-right National Front candidate, would “have a good chance” in the second round of the 2017 presidential elections. On the first round of local elections on March 22 Le Pen's far-right National Front (FN) achieved a historic high watermark, but again failed to outrun Nicolas Sarkozy's center-right UMP. “The National Front has done 10 points better than it did in the 2011 local elections, but its progress has stalled. It seems to have reached a ceiling,” said Bernard Sananes, head of the polling organization CSA on BFMTV. Of the total 2054 local voting districts, the UMP and its conservative allies took 170 seats outright, ahead of the left's 44 and six for the FN, according to the interior ministry's count. The Socialist Party came third with around 21 percent of the vote. 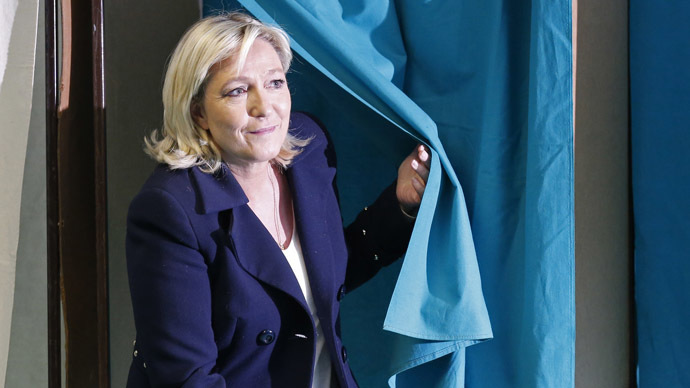 Le Pen has seen her party enjoy success in the recent European elections. They secured 25 percent of the votes and took over a dozen municipalities in local elections last year. The FN also secured a historic victory in 2014, winning two seats in the upper house of parliament for the first time.